Reeves County Hospital District has made dialysis easier and safer by bringing the lifesaving procedure closer to home for renal failure patients. In this state of the art dialysis facility we proudly offer the services of a full time board certified Nephrologist, an experienced nursing and technician staff, bio-med technicians, a Registered Dietitian, and a licensed clinical Social Worker (LCSW). Our patients enjoy a state of the art facility with the newest Fresenius model machines. Each patient has their own comfortable reclining chair, privacy curtain, and their own television monitor for viewing during treatment. The experienced dialysis staff provides ongoing education to maximize the effects of your treatment. Resources are available for your nutritional needs, psychosocial issues, and for your treatment options. There are also resources to assist with some of the expenses associated with hemodialysis, such as travel, medications, and medical equipment. The patients also have the availability and convenience of hemodialysis catheter insertion at Reeves County Hospital District. The goal of the Hospital District in providing dialysis in Reeves County has always been to relieve the burden of travel that so many have to endure to receive this life saving treatment. Our commitment to improving the quality of life for each of our patients is ongoing as six of our patients have received kidney transplants. We continue to work to get as many of the patients currently at our facility on transplant lists. We are very proud that our facility has continuously attained a top 10% rating for outcomes in the State of Texas. Dr. Charles Vaughn is the medical director for the dialysis center providing full time Nephrology services. 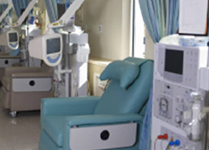 To request inforamtion and/or to schedule a tour of the dialysis facility call 432-447-0000.